The Rise and Shine is a transitional yoga-with-weights exercise that helps you relax after a strenuous workout. The exercise massages your internal organs and helps you unwind. Imagine you’re greeting the morning sun as you do this exercise, feeling its warm rays relaxing your body. Do a yogic Balancing Breath as you do this exercise. Don’t rush; take your time and relax. 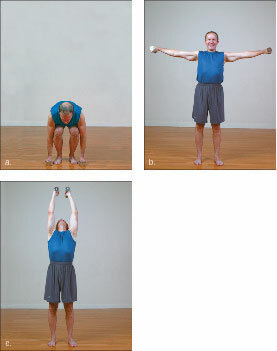 Crouch with your feet about 6 inches apart, your buttocks behind your heels, your elbows outside of your knees, and the weights in your hands with your palms turned inward. This is the starting position. You should be looking slightly downward. Keep your toes pointing straight ahead throughout this exercise. As you inhale, pull your belly in and press down through your feet as you rise to a standing position and extend your arms away from your body to the T position. Your palms should be facing downward at this point. Continue to inhale as you turn your palms upward and bring your arms together above your head, looking up as you do so. Steps 2 and 3 should be one continuous motion. As you exhale, slowly lower your arms, turn your palms downward again, and return to the starting position. Feel your body deflating as you exhale; slowly lower yourself to the ground in rhythm with your breathing. Repeat this exercise six to eight times.